Are you job searching in Philippines? Go through this, a very vital piece of information. After a lot of hard work and applying for various job vacancies in Philippines finally, you are called for the interview. The D-day is nearing, and you have a lot of preparation. From your resume, to what you are answering, there are many things. But sometimes the job seekers forget one of the most important aspects of the interview Dressing. Many experts say that the interviewers have an opinion about the candidate within the first few seconds that are often unchanged. So when you enter the job interview, you should create a long lasting first impression. The perfect dressing is an essential element for the success of the interview. You are dressing to portray yourself as a professional. Dressing cannot be neglected as it could cost you your best job in Philippines. The employers form an assessment based on what you are wearing and how you carry yourself. Though it is good to dress according to the industry and job you have applied for, as a thumb rule dress professionally for the job interview to make a great first impression. Remember one thing always dress for success. For Men – Men should always go for a well fitted, freshly cleaned and ironed business suit. A dark coloured suit with a light coloured shirt is a safe bet. Shoes should be traditional, well polished and in reasonably good condition. Style your hair neatly with no spikes and alike. Use of perfume should be in limits. A beautiful and elegant watch can complete your look. Always carry a briefcase or portfolio. For Women – Women should dress in a professional business suit with a skirt or a pant. The suit should be comfortable, well fitted, freshly clean and ironed. Solid colours are a preferred choice. Avoid anything that is tight, short or sheer should. The skirt should be of knee length. Wear a conservative blouse in light colours anything lacy, sheer or low-cut should be avoided. Shoes should be conservative with no open toes even in summers. Your hose should be neutral. Hairs should be neatly done with no flashy hair accessories. Makeup and perfume should be minimalistic. Complete your look with simple jewellery that matches your outfit. It is rightly said that how you dress, speaks for itself. So put your best foot forward. 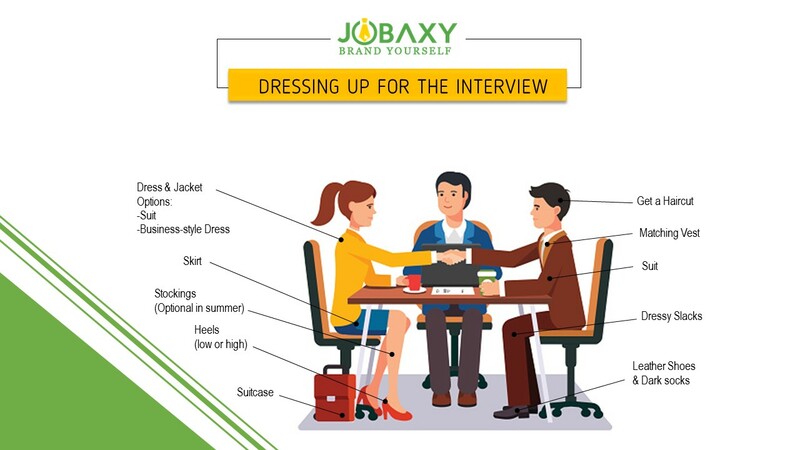 If you want to know in details about the interview dressing register with Jobaxy, the best job portal in Philippines.